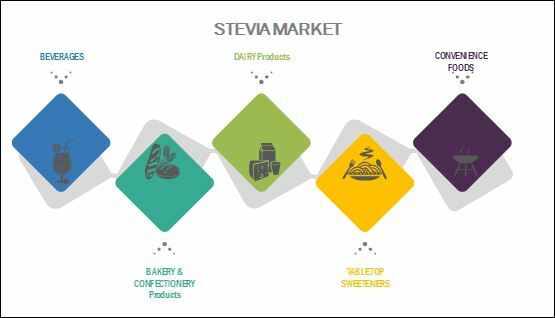 The stevia market is estimated to be valued at USD 490.1 Million in 2017. It is projected to grow at a CAGR of 9.5% from 2017 to 2022. Secondary research was conducted to obtain the value of the global stevia market for regions such as North America, Europe, Asia Pacific, South America, and RoW. Key players have been identified through secondary sources, such as the Bloomberg Businessweek, Factiva, and companies’ annual reports, while their market share in the respective regions has been determined through both, primary and secondary research. 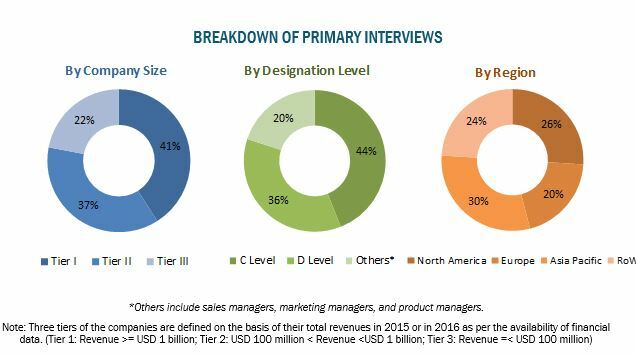 The research methodology includes the study of annual and financial reports of top market players as well as interviews with industry experts (such as CEOs, VPs, directors, and marketing executives) for key insights (both quantitative and qualitative) for the global stevia market. The key players profiled in this report include Cargill (US), Ingredion Incorporated (US), Tate & Lyle Plc (UK), PureCircle Ltd (Malaysia), GLG Life Tech Corporation (Canada), Wild Flavors and Specialty Ingredients (Germany), Sunwin Stevia International, Inc. (China), S&W Seed Co (US), Pyure Brands LLC (US), Morita Kagakau Kogyo Co., Ltd. (Japan), Zhucheng Haotinan, Pharm Co., Ltd (China), and Evolva Holdings SA (Switzerland). This report provides both qualitative and quantitative analyses of the stevia market, the competitive landscape, and the preferred development strategies of key players. The key players preferred new product developments & launches and partnerships & agreements as strategies to gain a larger share in the market. The report also analyzes the market dynamics and market share of leading players. Stevia is a plant native to South America whose leaf extracts are naturally sweet and are used to sweeten food & beverages. Commercially, stevia is a white powder composed of one or more intensely sweet glycosides derived from the leaves of stevia; it finds usage as a non-caloric sweetener. Stevia has its own unique taste profile and sweetness intensity, which is approximately 200 to 350 times greater than regular sugar. Many food & beverage companies use stevia as a natural sweetener to create products with enhanced taste and fewer total calories. 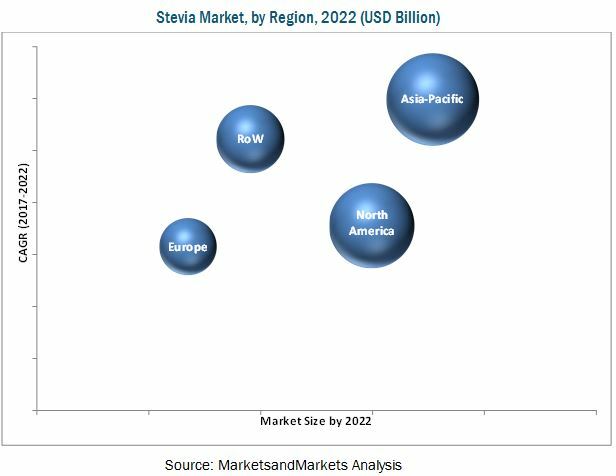 The global stevia market size is projected to reach USD 771.5 million by 2022, largely owing to its use as a sugar substitute in various applications such as dairy products, bakery & confectionery products, tabletop sweeteners, beverages, and convenience foods. Stevia is an attractive alternative to sugar and a clean label ingredient because it adds virtually no calories to the food or beverage product it is incorporated in. The major factor attributed to the growth of the stevia market is the increasing number of product launches and innovations in the food & beverage industry, coupled with the need to serve the demand for sugar alternatives from consumers suffering from diabetes and obesity. The price volatility of the stevia leaf acts as a major restraining factor for the growth of the stevia industry. Stevia leaf availability depends on seasonal fluctuations and crop yield. According to the Global Stevia Institute, China is currently the leading producer and major exporter of stevia around the world. GLG Life Tech (one of the key players) estimates that the amount of stevia plant grown in China has decreased significantly. The fall in stevia cultivation is expected to impact the growing demand for stevia, which will result in a supply crunch and lead to higher prices during the forecast period. Stevia is an emerging crop in many countries with a wide range of varieties, which also vary widely in their wholesale and retail prices. In general, stevia is more expensive than artificial sweeteners such as saccharin, aspartame, and sucralose. According to the African Export Association, international prices for refined stevia (at least 97% steviol glycoside by weight) range from USD 100 per kg to USD 150 per kg (2.2 lbs. ), while dried stevia leaves range from USD 2.00 per kg to USD 4.00 per kg. Hence, fluctuations in price and availability pose a difficulty in production planning and sourcing for processors and the food & beverage industry. One of the major challenges for stevia extract manufacturers is the taste offering. Traditional sugar continues to have preference over sugar substitutes such as stevia in terms taste profile. Initially, the product offerings were made with highly purified rebaudioside A (one of the steviol glycosides present in stevia extract, which is responsible of its sweetness), which in some instances has a bitter aftertaste, which has limited its preference as an alternative to sugar. However, advanced farming methods, conventional plan breeding programs, advancement in extraction technologies & methods, and optimizing solutions for new food & beverage applications have resulted in newer and better tasting stevia extract sweeteners with no bitter aftertaste. These advanced methods make the extraction of such stevia varieties more expensive. Hence, with more efficient methods, stevia extracts with more acceptable taste profiles will gain greater market presence. With its calorific benefits, this advancement presents high potential for stevia in the sugar substitutes market. The dairy industry has been strongly influenced by the advantages of using stevia. In an effort to reduce childhood obesity and boost milk sales, the International Dairy Association (IDEA) and the National Milk Producers Federation (NMPF) petitioned the FDA to change the definition of “milk” and 17 other dairy products, including sour cream and yogurt. This change would allow the dairy industry to add aspartame and other sweeteners such as stevia to products without including prominent labels for consumers. The most commonly used sweeteners, sucrose, dextrose (glucose), and corn syrups are fundamental in the production of confectionery items such as hard candy, caramel, taffy, chewing gum, chocolate, and gummed candies. In addition to their function in these items, they are widely used due to their low cost, availability, and ease of use during processing. The formulations of many sweetened confections are centered on the properties of stevia. Depending on the confection, stevia helps provide sweetness, improved mouthfeel, crystallization, texture, form, extended shelf life, flavor, and color to the final product. Stevia is used as a substitute for sugar to add natural sweetness to hot or cold beverages, to be sprinkled on fruits, or for use in several cooking and baking recipes. Stevia, as a tabletop sweetener, is a source of sweetness 200–300 times sweeter than sugar and is suitable for diabetics and people suffering from phenylketonuria. Natuvia by PureCircle, SteviaFirst Corp, and Truvia are some of the commonly known brands of stevia as a tabletop sweetener. Alternative sweeteners such as stevia are essential as they provide and expand beverage choices to control caloric, carbohydrate, or specific sugar intake. In case of beverages, stevia is the most preferred option as the bulking properties provided by sugar are not required. Stevia is one of the most common natural sweeteners used for zero- or low-calorie beverages. It is mostly used in beverages such as diet carbonated drinks, flavored water, soft drinks, fruit juices, ready-to-drink beverages, and sports & energy drinks. Stability, texture, sweetness, and mouthfeel of convenience food are essential factors that appeal to consumers. The other important factors that are essential to enhance the product appeal include shelf-stability, proper shape, color, taste, flavor, volume, and consistency. 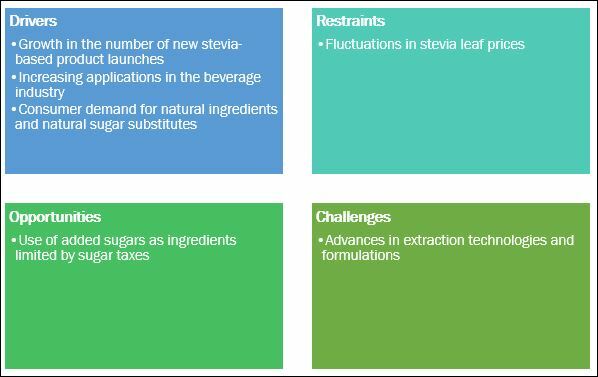 Stevia blends help to impart these properties to the food product without impacting its quality and its appeal to the consumers. Leading food ingredient manufacturers offer a broad range of stevia blends to meet these requirements. What are the upcoming technologies, substitutes, and trends that will have a significant impact on the market in the future? Natural sweeteners and low-calorie sweeteners are getting traction in the market; how will this impact the food industry in the next five years? Most suppliers have opted for new product developments as the key strategies as seen from the recent developments. Where will it take the industry in the mid to long term? The stevia market is projected to grow at a CAGR of 9.5% from 2017, reaching a value of USD 771.5 million by 2022. The market growth is driven by the increase in the customer demand for natural sugar alternatives, zero calorie beverages, and healthier foods incorporating natural sugar substitutes. The stevia market is also driven by factors such as the positive outlook for stevia as a natural sweetener and increasing number of innovative product developments for stevia and stevia-based products that are cost-effective and find application in a wide range of food & beverage applications. Stevia Market report categorizes the global market by extract type (whole leaf, powdered, and liquid), application (dairy, bakery & confectionery, tabletop sweeteners, beverages, and convenience foods), form (dry and liquid), and region. Based on extract type, the whole leaf segment is projected to witness the fastest growth, at a CAGR of 11.1% from 2017. The demand for whole leaf stevia among food & beverage manufacturers and processors is driving the growth of the whole leaf stevia segment. Based on application, the beverages segment dominated the stevia market, in terms of value in 2016. In the beverages segment, stevia finds application in soft drinks, RTDs, carbonated drinks, juices, and energy drinks. The global stevia market was dominated by the dry form of stevia, which includes purified or concentrated white powdered stevia and green herbal leaf powder. The Asia Pacific region accounted for the largest market share for stevia, followed by North America and RoW. 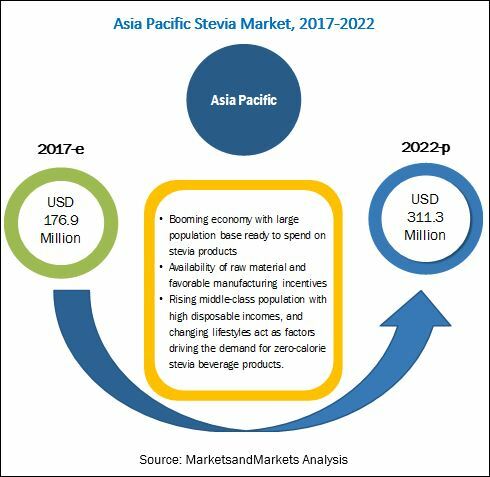 With a population of more than 4.2 billion and rising income of consumers, stevia sweeteners are projected to witness an increase in the customer base in the Asia Pacific as it is an important segment of the sweeteners industry. The Asia-Pacific region is projected to be the fastest-growing market, with investments from several multinational manufacturers, particularly in countries such as Japan, China, and India. The stevia market is fragmented and competitive, with a large number of players operating at regional and local levels. The key players in the market adopted strategies such as acquisitions & mergers, new product developments, and expansion & investments. Prominent players profiled in the report include Cargill (US), Ingredion Inc. (US), PureCircle Ltd. (Malaysia), and Tate & Lyle PLC (UK). 10.8 Sunwin Stevia International, Inc.
10.11 Morita Kagakau Kogyo Co. Ltd.